Terry Morse is a retired from Postal Service 35 1/2 years. Was a QWL Coordinator over 10 years in Van Nuys and Santa Clarita P&DC. He has lived in Saugus since 1981. 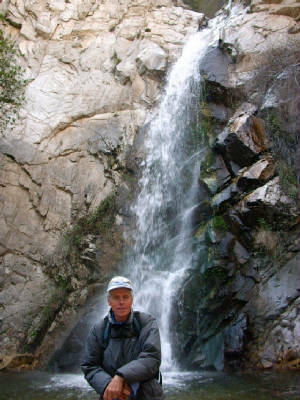 He has been hiking for about 40 years through the San Gabriels, Sierras, deserts and also in other Western states. Being particularly fond of hiking to the tops of peaks, he is sometimes referred to as a "peakbagger". He is extremely adventurous, and he enjoys all kinds of hiking and exploring. Towsley Canyon is one of his favorite local areas because it's flora and fauna are so diverse, and the views are strikingly beautiful. Since retiring, he has started hiking full time and is delighted to be a hike leader for the CHC. 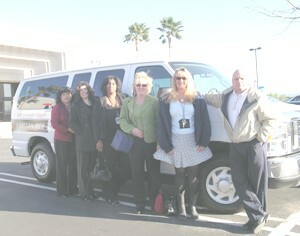 Monday March 3, 2008 was the first day for a van pool for 7 Sierra Coastal district employees. Melody Kemsley spearheaded the project and got the ball rolling. The much anticipated day brought smiles to the faces of each person. Eileen Grossguth was the driver for this momentous occasion (The riders volunteer to take turns to drive the van). As Eileen opened the driver’s door of the 8 passenger van, you could hear the fun everybody was having from the trip. The van pool participants are: Rosie Beattie, Eileen Grossguth, Alex Grossguth, Janie Isaguirre, Melody Kemsley, Gina Morris and Darrell Morrow. While most of us are drivng to work, fighting traffic, hassling with drivers to change lanes, thinking about everything to do for the day, these happy go lucky seven are having the time of their life. Imagine; having fun on the way to work – and it’s only Monday! Maybe they were so happy because they were enjoying socializing with each other. Maybe it was because they were relaxed not having to fight the traffic. Maybe they could actually look at the scenery they have driven by for years and never noticed. Or maybe it was because of all the good they will be doing for the environment while taking seven vehicles of the road. Here is a thought: If you drive a car that gets 30 mpg on the highway, and you share your ride with one other person, it is like each person getting 60 mpg. If the van these employees are driving average 12-15 mpg and eight people share it, it’s like getting 96-120 mpg per person! Just think of all those emissions not going into the air because of seven people. So, you are not sure you believe in the news hype about the ozone layer or the impact of green house gasses on our environment, global warming, or any of that? How about the thought of saving the other kind of green? The kind in your wallet, that is. First, here are a few questions. If you buy a car, most of us cannot afford to pay cash so we put some money down and make a payment of several hundred dollars per month. Then we fuel that vehicle. Don’t forget other incidental costs like tires, brakes, oil changes, depreciation, and insurance. Now how much do you think you are paying per month? What would you say if these seven people are only paying about $137.00 per month, including fuel? When I asked Melody about the experience, she summed it up by saying:”I look at it as more income!” Oh yea, did I mention you could get a $115.00 monthly wage credit? So, now are you interested? If you are, you can call: VPSI @ 1-800-van-ride or Jackie Carter (VPSI manager) @818-727-2050. You can also talk with Melody Kemsley at the district by calling 661-775-7887. And in case you did the math at the beginning of this story, they do have room for one more!